I want my country back and I want it back now! Not much hope I’m afraid. Getting on to be a very large section of the population are recent immigrants (post 1990) or born after 1980. They have never even known the country you (and I) lament. And they vote (or worse, they abstain from voting). …and if I could find Campbell’s limp interview with Len Brown, I would submit that also. Dangerous Dave – you have chosen two – plus a 3rd – interviews where John Campbell has raised issues that I assume you disagree with. No problem with that – we all have our opinions and obviously we will agree to disagree on a number. But John Campbell asked the ‘inconvenient’ questions to those in power – whether right or wrong – he asked them – and as you illustrated, he asked them to both Labour and National. He also brought to public attention the situations of those less fortunate than others and as a consequence those that cared in our society responded in kind and/or in donations. That is what is we have lost. You may not like the messenger but it is the message that was important. It would be revealing if Dan could post links to any – any! – interviews done by Mike Hosking, that held politicians to account, and were memorable for their impact. The answer is, of course, none. There are no such interviews because Hosking has expressed his affiliation to National and is therefore partisan. As for Paul Henry… he can balance a big red ball on his nose in return for some raw fish tossed his way, but otherwise the man is hopeless. Even his “fans” may think he’s funny (? ), but don’t take him seriously. 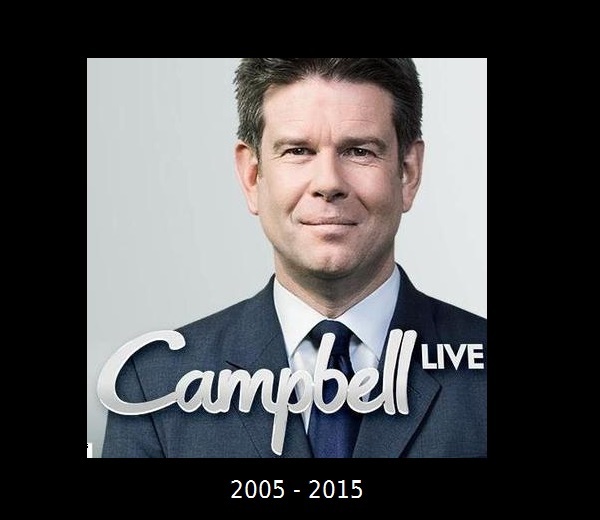 The fact that Campbell’s critics can point to his interviews that were memorable and outstanding shows the impact that John Campbell has had in this country. The networks (including State owned) have reduced free to air television to a moronic no-go zone, particularly before 9pm. But hey, that’s been the plan all along. 1. It keeps a large section of the population uninformed and degrades public discourse. 2, It drives people into the clutches of Murdoch’s Sky Network. And of course, it’s profitable. Hey Frank we’ve got both, in this civilised age 2000 years on – bread and circuses and corporation mangled news drivel – I think it is called progress – from liberal to neo liberal, and from current affairs to drivel.. oh and circus in every town – whether one wants one.. Hey Dunedin how much you shelling for yours? I’ve managed to not post any lament about the loss of John Campbell from the Nation’s Current Affairs programing. What appears to be under reported is the fact that the subject of all the hand wringing chose or elected to not renew his contract late in 2014. He had effectively made the decision then. Now who knows what was said in this discussion? Any scoops? Of course this little gem has been neatly swept under the carpet in the rush to have a whinge. If the issue is one of revenue then clearly the NZ population is not motivated to pay sufficient to keep it alive. And here’s the rub. Why should we expect a foreign (at various points in its history) owned media corporation to be offering publicly beneficial news and current affairs content? In the current environment? Is it their job? Their job as with any psychopathic corporation is to maximise shareholder return. See the doco movie ‘The Corporation’ google for free watch. If the issue is that one can only get ones news media from TV – juxtaposed against the ample content available for she who surfs, uses RSS feeds, or goes to source online – then surely the argument is for a properly resourced and pitched public broadcaster? One who really holds a light to/on power and the PTB. How many of those whinging, would contribute to the democratic project to do something positive? Now this would be powerful. How about the activist journalists ignite it? I know folks disdain losing things they see as institutions, however the game surely is to build new institutions that work. And is there a mass TV audience anymore for Real news? Where are the media studies students and academics outlining the nature of our new$ media? Where are the public spirited economists and business lecturers sharing a way through, so that those immersed in the matrix with their blue pill of oil fueled prosperity, can get a few shades of pink – or is that merely the colour of the callous business folk’s ties? After 24 years in the current affairs media circus in a declining vehicle, perhaps Campbell saw the writing on the wall – then this is just a cynical means of boosting his next pay-packet offer? Noisy swan song.. looks like a big bang to me..
And if one wants real news, throw the bloody TV out of your apartment window. I don’t bother watching it at all. Folks tell me that Maori TV is real good. Now how can they get funding for quality public broadcasting? Best we step across and learn – where’s that story? Only attack when you have exhausted all other means. How desperate and keen are we to gain a truly balanced perspective of those who hold the Key to the treasury? Public broadcasting as an institution would assist to address the institutional imbalance in public knowledge and the resultant discourse.